Recently revealed at CES and available for sale on the 14th of January, the new SolarFocus Kindle cover seems to be an interesting solution to a problem that few, if any, people have run into. This doesn’t mean that it will fail to impress as a gadget or that it is in any way useless, but one has to wonder how big the market will be for something like the SolarKindle cover. Essentially this cover is meant to serve as recharging station, backup battery, and book light all in addition to the normal screen protection function. Certainly not a bad thing. The case’s internal battery carries a charge sufficient to add an additional three months of battery life to the Kindle 4 and can be recharged over the course of eight hours of direct sunlight exposure if you don’t have access to a powered USB port or adapter. Even one hour is supposedly sufficient for as much as three days worth of reading time. Sadly, there are any number of drawbacks. In terms of basic use, there are a few obvious problems. The addition of this cover more than doubles the weight of your Kindle, along with doubling its thickness and increasing the size of its footprint to slightly larger than the Kindle Keyboard. The added size and weight remove a great deal of the appeal that the $79 Kindle carries. The SolarKindle case itself also appears fairly unappealing, though some might disagree with me if they find solar panels and white plastic pleasant. Perhaps the most striking thing about this case, however, is the pricing. At $79 itself, it will double the cost of owning a Kindle. I have nothing against a desire to be environmentally friendly, but this doesn’t make sense to me. Given the fact that the Kindle 4 already runs for a minimum of three weeks at a time between charges (based on regular personal use on my part), how could it possibly be worth the inconvenience of the bulk and weight just to avoid having it find a wall outlet? As of the Kindle 2, we already have analysis indicating that eReaders become environmentally friendlier than buying new books as of the 50th title or so. Probably safe to assume that things have gotten even better by now, but even ignoring that entirely we have to assume that the impact of manufacturing these covers will be sufficient to increase the numbers. How quickly can saving $0.25 or less per month in electricity help this case start to pay for itself under any metric? 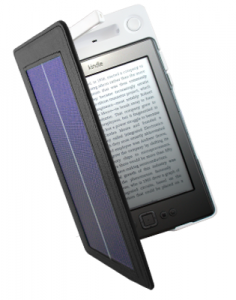 Despite the hype surrounding the CES reveal, it seems unlikely that the SolarKindle will take off. The price is too high and the benefits too few. It isn’t as if you were adding months of battery life to a tablet or smartphone. If you spend months at a time without access to power, this might be the case for you. For anybody else it is not much better than an ostentatious nod toward “Going Green” that the Kindle, despite having numbers to support such a claim, fails to advertise on its own. This entry was posted in Kindle 4, Kindle Accessories and tagged CES, kindle 4, kindle cover, solarfocus, solarkindle by matthew. Bookmark the permalink.